I can't help you with money, but maybe this site will save you time, and offer you some encouragement to help you achieve your aviation goals as a new student. Flying can be so much fun -- don't give up; you CAN do it!!! P.S. That's me in the photo, but the plane is a fake -- it's at the Toronto Zoo, and I am totally posing. 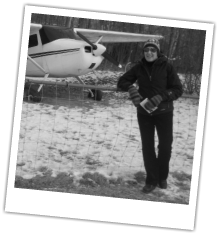 As of Dec 2010, I only have about 12 hours in the air, and believe me, I am nowhere near to soloing! !